Red is the color for February. It’s also the color of this year’s Winter seasonal release, the Royce Gianduja Nama Chocolate. Gianduja mixes together chocolate and hazelnut paste—think Ferrero Rocher and Nutella. 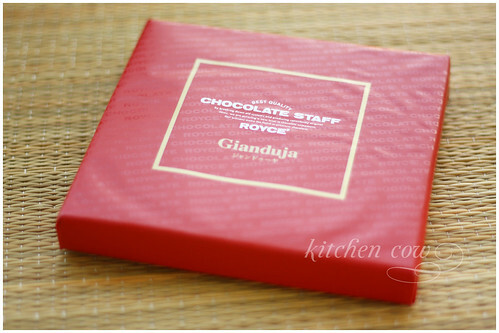 Royce’s Gianduja Nama Chocolate is a not too sweet, velvety smooth Gianduja that’s liberally dusted with cocoa powder. Typical heavenly Nama chocolate actually, only with a hint of creamy hazelnut. It’s really really yummy. (Notice how my vocab devolves when faced with Royce chocolate?) Admittedly, Champagne Nama still owns my heart but Gianduja puts up a good fight. If you’d like to try it, dash to Royce Rockwell already as the store staff told me it’ll be available until February only. 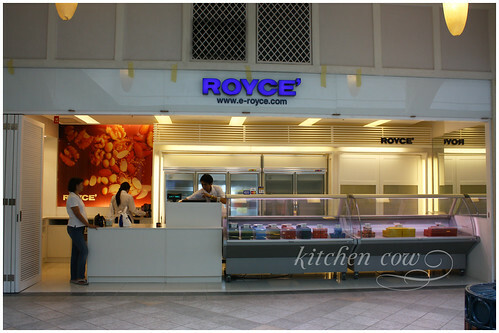 The store’s at the 3rd floor of Rockwell Powerplant Mall in Makati, beside the escalators. This entry was posted in food shopping, food spotlight and tagged champagne, cocoa powder, gianduja, hazelnut, rockwell powerplant mall, royce chocolate. Bookmark the permalink. How much IS one? I’m so tempted to try it… I haven’t had a gianduja marjolaine since we left France ages ago. The bakery that sold it near our apartment then would often be out of stock on it. Oooh, you’re based in Japan? I so envy you. I really want to go on vacation there sometime in the future. Sooner more than later, I hope. It’s 580PhP in Manila, that’s around 12USD methinks? I remember buying for 14SGD in SG and 85 HKD I think in HK. argh! I loooove Royce. Too bad they don’t have a store here in Davao. I would have to fly there to have a taste of that new flavor. Sigh…. so thi is the royce candies my friend has been telling me about. expensive seguro. sa rockwell,e.